If you had to pick five people that sum up your life, who would they be? If you were to raise a glass to each of them, what would you say? And what would you learn about yourself, when all is said and done? We begin When All Is Said by meeting 84 year old Maurice Hannigan, a man who has lived quite the life and is about to share snippets of it with us readers, sitting at the bar of a local hotel, ready to raise five toasts to five very important people through the course of the evening. The premise of this book sounds simple to an extent, and yet I was engaged throughout - wanting to know more about Maurice's life, and those he loved & trusted. Maurice shares stories of his life with regards to the people he toasts, and talks with such honesty and candidness through it all; the good & the bad. I felt like I knew Maurice, as an old friend, and the feelings he conveyed filled me with emotion. The toasts to his brother, Tony, and his wife, Sadie, truly hit me the most. Anne Griffin has written a touching and thought provoking read, with you recalling the own moments and memories that have shaped your life, just as Maurice does. They way in which she writes connects you to the story of Maurice, but your own also. 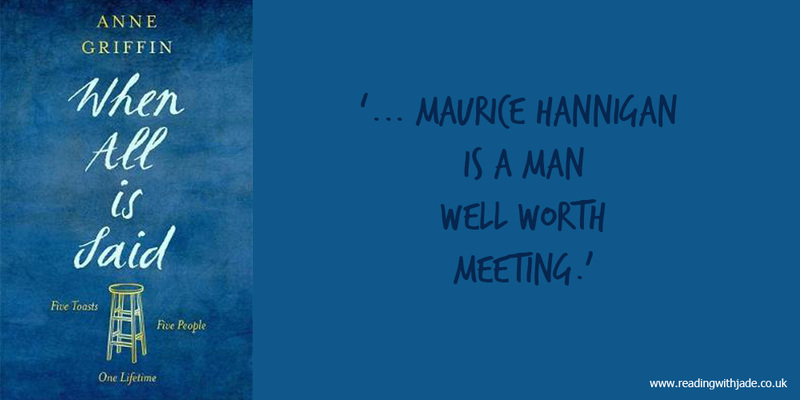 As you get comfortable in Maurice's story, you know how it is going to end, and yet the ending still hurts; once finished, I put this book down with a heavy heart, however Maurice Hannigan is a man well worth meeting. Elizabeth's eyes have failed. She can no longer read the books she loves or see the paintings that move her, but her mind remains sharp and music fills the vacancy left by her blindness. When her father's journals are discovered on a shipwrecked boat, she enlists the help of a delinquent teen, Morgan, to read to her. As an unlikely friendship grows between them, Elizabeth is carried back to her childhood home - the lighthouse on Porphyry Island, Lake Superior - and to the memory of her enigmatic twin sister Emily. But for Elizabeth, the faded pages of her father's journals reveal more secrets than she anticipates. Mystery runs deep throughout The Lightkeeper's Daughters, as the lives of Elizabeth and Morgan serendipitously intertwine. Elizabeth is an elderly lady living in a care home, and Morgan a troublesome teen assigned to community service at the care home in which Elizabeth resides. As the two cross paths, an unexpected bond is formed. The story itself is, for the most part, told in alternating chapters between Elizabeth and Morgan. This storytelling method is an effective way in which to get to know both main characters individually, as well as seeing the relationship between them evolve from both sides. Once you settle into the book and follow the flow, as well as identifying the two distinct voices of Elizabeth and Morgan, The Lightkeeper's Daughters is a truly captivating read. Elizabeth tasks Morgan with reading her dad's journals from when he worked as a lighthouse keeper, with Elizabeth sensing some long held family secrets may be being stored within. It is through these journals that the two connect, with life long mysteries slowly being revealed. I really enjoyed the pacing of this book, as well as the overall plot, and the way in which the author wrote surroundings and landscape was atmospheric at times. The Lightkeeper's Daughters is the kind of book where the little you know going in, the better. 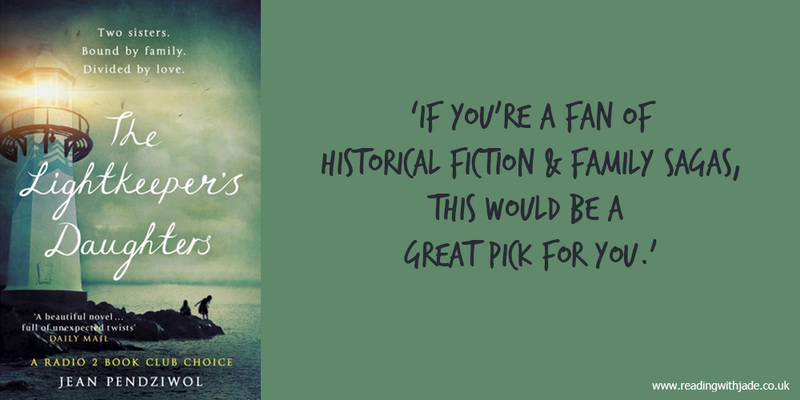 I will say though, if you're a fan of historical fiction & family sagas, this would be a great pick for you. For me, this was one of those books you find yourself buying on a total whim, but I'm happy to have done so as I've discovered a gem of a read. Four years ago, Judith and her best friend disappeared from small town Roswell Station. Two years ago, only Judith returned, permanently mutilated, reviled and ignored by those who were once her friends and family. Unable to speak, Judith lives like a ghost in her own home, silently pouring out her thoughts to the boy who's owned her heart as long as she can remember - even if he doesn't know it - her childhood friend, Lucas. But when Roswell station is attacked, long-buried secrets come to light, and Judith is forced to choose: continue to live in silence, or recover her voice, even it means changing her world, and the lives around her, forever. Going into this book, I knew literally nothing about it other than the short blurb on the back, so reading it definitely came with a few surprises - the first being just how much I enjoyed All The Truth That's In Me. The other surprises include the fact that this book is historical fiction, as opposed to contemporary which I had initially thought it was when borrowing from the library. All The Truth That's In Me is the story of Judith, who not so long ago returned to her hometown after being missing; when she arrives home she is without a portion of her tongue. The traditional tight knit community, largely governed by religion, doesn't take kindly to Judith's return, especially as she isn't sharing about her time away from the town. The book is told from Judith's perspective, often flitting between day to day life and the years in which she was missing, in short, sharp chapters. I would say it took me the first 50 pages in order to get into Judith's mind, what with the story telling method, but once in I felt compelled to keep reading. Judith is a character you quickly come to like - you can feel her love for Lucas, her frustrations at many a thing, the heart & kindness that she has for others. Watching Judith transform over the course of the story is a beautiful thing (in fact my favourite thing within the pages). 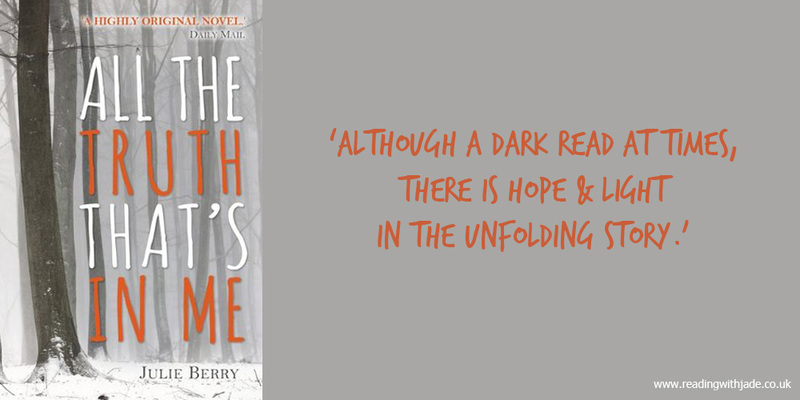 Although a dark read at times, there is hope & light in the unfolding story. I'm happy to have stumbled across this book. Dora wishes she was invisible to her abusive parents. 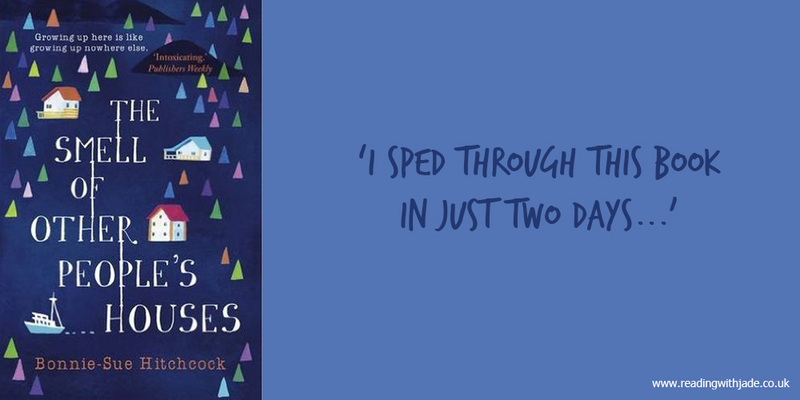 Bonnie-Sue Hitchcock's extraordinary, stunning debut is both moving, and deeply authentic. These intertwining stories of love, tragedy, wild luck and salvation on the edge of America's Last Frontier introduce a writer of rare and wonderful talent. The Smell of Other People's Houses is four stories in one, with four teenage narrators whose lives all connect in some way or other. We meet all four - Ruth, Hank, Dora and Alyce - at crucial life moments, and follow along as life plays out over the course of four seasons in 1970's Alaska. I sped through this book in just two days - it is short in length, with my copy being just over 250 pages, and yet the author has packed so much into it... But in a good way! I found myself quickly invested in the lives of these kids, especially that of Ruth & Hank. Ruth, Hank, Dora and Alyce have such depth to them as characters; they are complex with flaws and vulnerabilities and felt like such genuine people. Not only were the four main characters really well written, but the entire cast were too. The dynamics of various relationships throughout the book were well crafted also - especially the intricacies of familial relationships. I definitely couldn't review this book without mentioning Alaska - the setting of The Smell of Other People's Houses, with it reading like an extra character at times. The portrayal of Alaska was insightful and explorative; I felt as if I had been transported... You can definitely tell that the author was born & raised within this environment. Great reviews! I love the Smelly Houses book. It was one of my top 10 favorites last year. 'Smelly Houses' book did give me a chuckle when reading your comment. Haha! I can see why it was a top favourite of yours. Great reviews! The Lightkeeper's Daughter has me very confused because Hazel Gaynor has a book by a very similar title that I just finished. This one sounds very different but very good. I think all of these sound like books I need to read! Having read The Lightkeeper's Daughters, logged it to Goodreads and such, I've discovered there are quite a few books with a similar sort of title so I can see where the confusion comes from, and am not surprised to hear of it either. I hope you enjoyed your lighthouse book - I've heard good things about Hazel Gaynor's writing. I hadn't heard of any of these books. Thanks for sharing your thoughts on them! The Smell of Other People's Houses sounds especially wonderful. I was happy to have finally read The Smell of Other People's Houses and would highly recommend it - it is indeed wonderful, and such an immersive read also. I haven't heard of all the books you listed here. But hey, it's always good to learn something new, right? Ah, working down your Netgalley stack - we've all been there - enjoy! I keep hearing great things about The Smell of Other People's Houses so I'm glad you enjoyed that one. The Alaska setting really appeals to me. I think you would quite like it, Suzanne.